Keyword research is one of the most important factors that influence the success of your website’s rankings. Websites that rank at the top positions in the SERPs always have a solid keyword research strategy – and so should you. 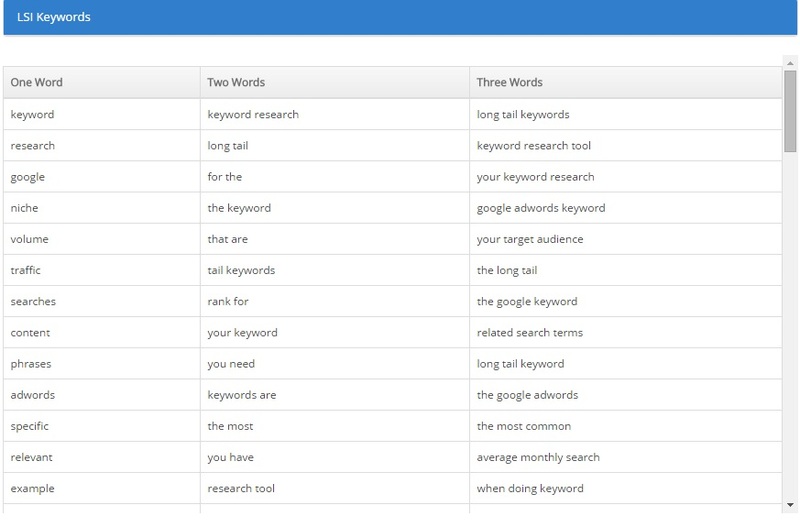 Today, I will share with you a brand new SEO tool that makes keyword research extremely easy and intuitive – KeySearch. KeySearch is created by the same guys who created FCS Networker and is looking to help search engine marketers with their keyword research the way it helped people create and manage their own Web 2.0 private blog networks. This will be a detailed in-depth look at KeySearch and all of its functionality plus our honest review of the tool and an exclusive 20% recurring discount. 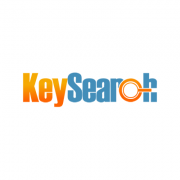 KeySearch features preview – a quick look at the functionality provided by this keyword research tool. KeySearch ultimate tutorial – real life examples of the things KeySearch can do for you. Our honest KeySearch review – what we think of the tool. Exclusive 20% KeySearch discount – an exclusive discount coupon (“inetsolutions”) that will give you 20% discount on the tool for life. Keyword research – KeySearch allows you to simply enter a seed keyword and then it will suggest to you up to 1,000 niche relevant keywords with monthly search volume, CPC, and PPC info. Not only that, but you can also use YouTube suggest to get keyword ideas for YouTube as well as insert the URL of your competitor to see what keywords they are ranking for. In a nutshell, KeySearch gives you the power to find hidden profitable long tail keywords a.k.a. gems. Competition analysis and difficulty checking – KeySearch ranks keywords by a single difficulty number from 1 to 100 which easily tells you how hard it will be to rank for a certain keyword. It generates the number by taking into account both on-page and off-page factors of the top 10 ranking URLs for said keyword to give you an accurate estimate of the difficulty. LSI keywords suggestion – KeySearch also allows you to perform deep analysis on keywords of your choice which will generate LSI keywords from the main seed keyword. Including the recommended LSI keywords in your content will give you the extra edge you need to rank faster and higher on Google. Rank tracking – KeySearch is not only a keyword research tool, but also a rankings tracking tool. It basically allows you to enter your URL and a set of keywords for it, and then it will go out and check this URL’s rankings for each of its keywords. The rank tracking feature of KeySearch also includes the tracking of your domain’s Moz and social stats and a secondary URL which can be your competitor, so you can keep an eye on them as well. Reporting – both the keyword research and rankings tracking features of KeySearch allow you to easily generate detailed reports of your data in either CSV files or white-label PDF reports for your clients. Now that you have an idea of what this SEO tool is capable of, let me get you behind the scenes to show it to you in action. Every single component of KeySearch will be explained along with a real life example. It will be over quickly as this is one of the simplest tools I have used. 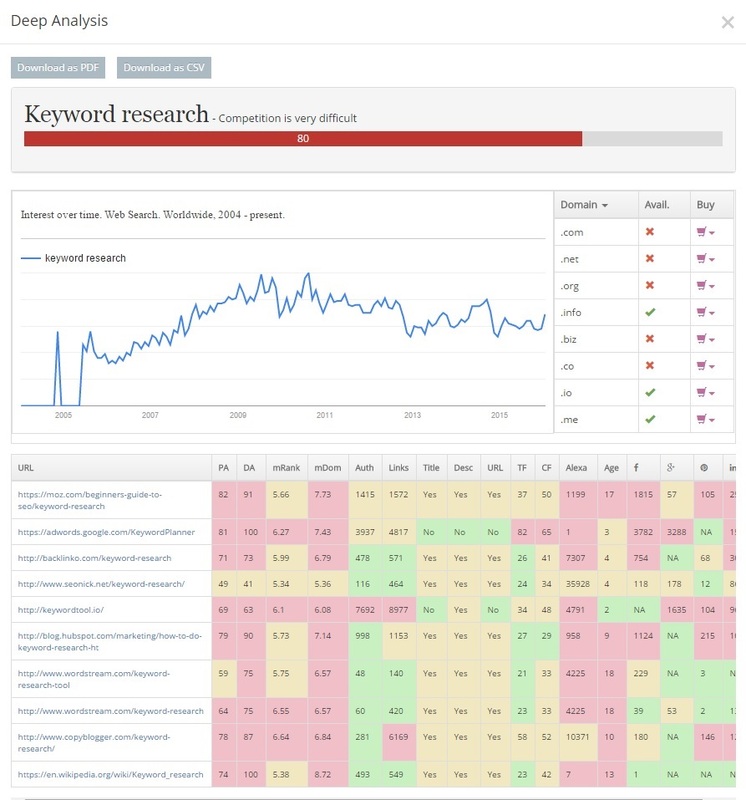 KeySearch is split into a “Keyword Research” component and a “Rank Tracker” component. Of course, most of your work will be performed in the first one as the second one requires a more setup once and forget about it approach, so let’s start with the “Keyword Research” component. Basically, this is where you will perform all of your keyword research to find those priceless keyword gems that everyone is looking for. Let’s begin. Dark Red – high level of competition. Light Red – fairly high level of competition. Yellow – moderate level of competition. Dark Green – fairly moderate level of competition. Light Green – low level of competition. Light Blue – very low level of competition. Now, below the keyword difficulty you see a Google Trends graph, which shows you the keyword’s search volume from 2004 up until today and the TLDs that include the keyword and are available (or not) for registration. The last three columns display whether or not these pages include the keyword in their titles, descriptions, and URLs. Again, each cell is colored and the colors mean the same thing as with the keyword difficulty but unify the light and dark colors into one – so basically green is good, yellow is okay, and red is bad (for you). For instance, from the above table you can see that the URL ranking on second position for “keyword research” does not have that exact keyword included in neither its title, description or URL. While this may have been a bigger factor in the past (pre-Hummingbird), nowadays it is not so big a deal, however, including this exact keyword will give you a little bit of extra edge over your competition. As you probably know, stuffing the same keyword over and over again doesn’t work anymore. Synonyms and LSI keywords is the new keyword stuffing – check out this article for more info on the subject. That’s because Google has shifted its focus from keywords to topics. It generates LSI keywords by scraping the content of the top 10 pages and analyzing them to see which keywords and phrases are most used by the top 10 results. Having a lot of different keywords from a particular topic in your content will help it rank both higher and faster on Google. Now, KeySearch also allows you to download this deep analysis as both a PDF or a CSV file. As we already mentioned, the PDF file is a white-label report so you can easily brand it. Save Keywords – saves the keywords you ticked from the table on the left hand side. KeySearch works with keyword lists, so you can easily separate your projects. Compare – shows a window comparing the keywords you ticked from the table on the left hand side and also allows you to download a comparison report – again in both PDF and CSV files. Export – allows you to export the data for the keywords of your choice. It took KeySearch about 5 seconds to get the data for all of the 50 keywords I inserted which is pretty decent. As you can see, there aren’t many low competition keywords in the “keyword research” niche. I have selected one that has a fairly moderate level of difficulty, but its search volume is still quite low, so I wouldn’t exactly call it a “keyword gem”. The difficulty tab uses http://grepwords.com/ to find quick search volume and CPC estimates. Not all keywords are in the grepwords database. Really depends on popularity. 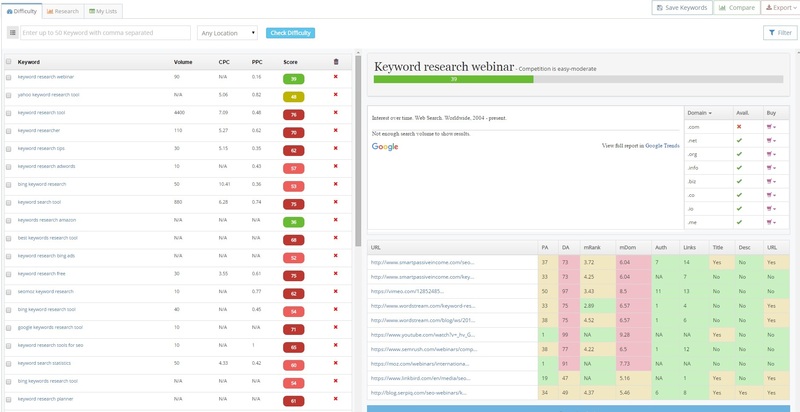 Scraping Keyword Planner for every keyword entered on the difficulty page would take a really long time. So its more of an estimate on the difficulty page for search volume, CPC and PPC. The keyword research tab’s main search [the “Research” page which we will take a look at in a second] uses AdWords which will give up to date accurate search volume, CPC and PPC. Anyway, clicking on any of the different rows from the table on the left hand side will show all the data about that keyword on the right hand side – easy as that. And that’s basically all there is to the “Difficulty” page of KeySearch. As a final step, I will save all the keywords I researched to a list called “Keyword Research”. 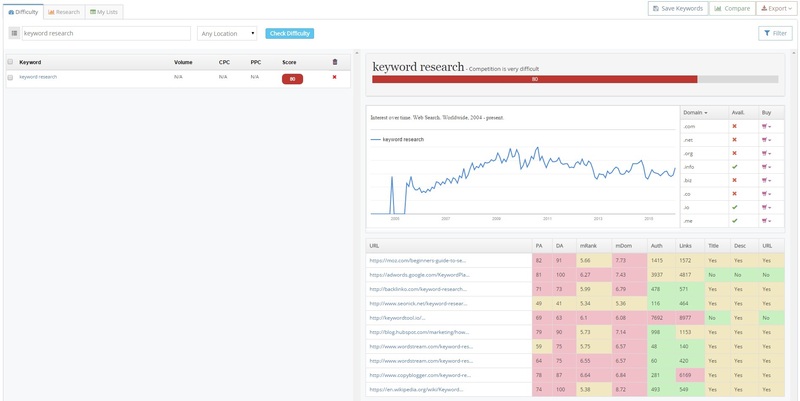 Now let me show you the “Research” page of KeySearch which makes keyword research ridiculously easy to perform. The difficulty score will, by default, only be shown for keywords that you have already checked on the “Difficulty” page. Of course, you can easily check the difficulty score of other keywords by simply clicking the “Check” button. Now, the “Research” page has an extra button on top compared to the “Difficulty” page and that’s the “Bulk Check” button. It allows you to bulk check the difficulty for all the keywords you select from the table on the left hand side. And there you have it. Several keywords with a decent monthly search volume and a level of competition that can easily be dominated with the right strategy. Pretty simple right? I just entered a seed keyword, bulk checked the difficulty of a selection of the relevant keywords that KeySearch generated for me and then filtered out the results to find a few profitable keywords. 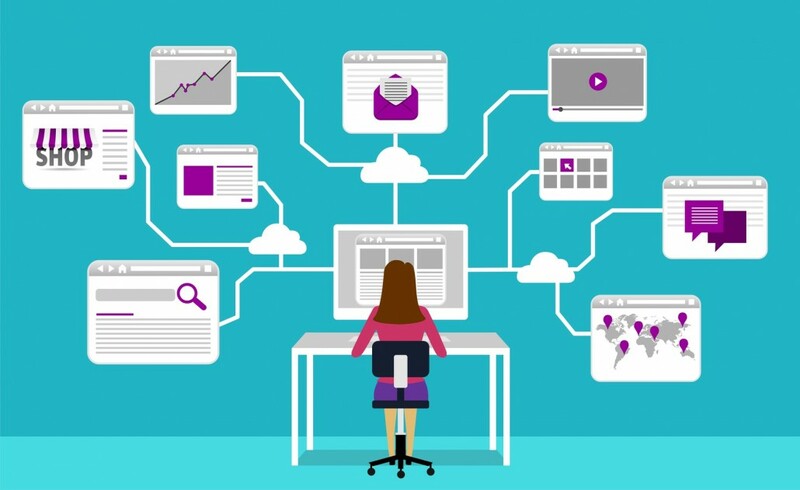 Repeating this same process for each article (piece of content) your write for your website will most certainly put you at an advantage in comparison to your competition. Finally, I will again save the keywords that I found from this keyword research to the “Keyword Research” list, so I can later use the data to come up with an idea for content. That’s the basic goal of keyword research – to point you towards content that people are looking for from which both you and the people looking for that info can benefit. Quid pro quo. If you think about it, it’s really a bit more complex scenario of the more common “ask and you shall receive” situation. You are basically looking for something that people are asking and then writing the answer to their questions using those vital keywords that you found from KeySearch. Moving on. The last page of the “Keyword Research” functionality of KeySearch (remember there’s rank tracking as well) is “My Lists”. There isn’t much to say about it except for the fact that it basically stores all your keywords into separate user-defined lists. I strongly recommend you creating your own lists for each project instead of using the “default” list provided by KeySearch. And that’s basically all there is to the “Keyword Research” component of KeySearch. Now let’s take a look at its “Rank Tracker” component. Each of them is self-explanatory and will respectively allow you to track the rankings of your website, group your URLs and keywords, get notified when certain events occur, and generate in-depth reports for your rankings. I just want to note that I personally don’t use the “Rank Tracker” component of KeySearch as I use Pro Rank Tracker (our tutorial and honest review) to track the rankings of my website. Now, let’s look at each of the four pages. As you can see, it’s extremely simple and intuitive. Basically, you just click the “Add URL” button, then you fill in the URL which’s rankings you want to track and you click “Submit”. Keep in mind that you do not need to add exact URLs, but just your domain name and KeySearch will track any URL on your domain that ranks for any of the keywords you include to the URL. At this point you will have added your URL, but you need to add keywords to it for which KeySearch will check its rankings. You simply expand the URL and you click the “Add Keywords” button after which you choose the search engine on which you want to track the rankings and then you paste in your target keywords. And that’s it. Now, KeySearch will take some time to automatically update the rankings for new URLs and keywords, however, you are allowed to force the update immediately. The end result? I just added a few target keywords of my website to show you how KeySearch’s “Rank Tracker” component works and that it is accurate. Now, clicking on each of the keywords themselves will bring out a window where you will be able to see the SERPs for that keyword (on the search engine you chose) up to the point where your URL is currently ranked. 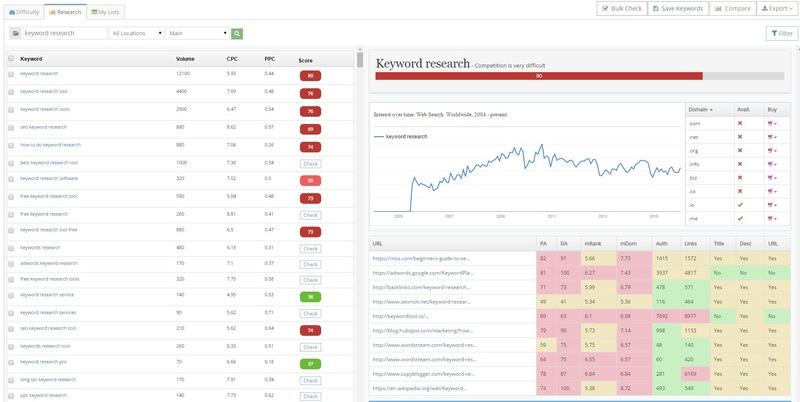 Via the “Actions” column of the keywords table, you can respectively check the keyword’s rankings over time in a graph style, delete the keyword, add a secondary URL for tracking (your competitor for example), deactivate the keyword, and force an update on the rankings. The latter you can do once per day per keyword. The “Groups” page of the “Rank Tracker” component of KeySearch basically allows you to group your URLs for an easier management. For instance, if you will be using KeySearch to track the rankings of your clients, you can easily separate the different tracking projects with groups. This will also help you later on when you set up the reporting for those rankings, which we will cover in a minute. Changes by more than – a change in the rankings of the URLs in the selected group by more than the number you specify. Enters the top – when any of the URLs in the selected group enters the top user-specified value. Leaves the top – the opposite to the above option. Gains more than – when the selected group gains more than the user-defined number of positions. Loses more than – the opposite to the above option. These notifications are extremely useful, especially if you are running projects for you or for your clients that have specific goals to be reached – as it is usually in the world of SEO. The last page of the “Rank Tracker” component of KeySearch allows you to set up shared reports so that you or your clients can easily check their rankings at anytime. You can select between live and static reports and define a period time of up to 90 days for which this report will be valid. For instance, if you are tracking the rankings of a client of yours for a period of 30 days, you can set up a live report for them for their URL group for 30 days so that they will be able to check their rankings at anytime in those 30 days. And that’s basically all there is to KeySearch currently. Keep in mind that the product is still being updated constantly and new features are added on a daily basis. Just recently a new functionality was added that allows KeySearch users to order articles (for the profitable keywords that they found) right from the tool’s user interface. Being one of the first users of KeySearch and knowing what Dan has achieved with FCS Networker, I am confident to say that KeySearch will be a “key” player in the keyword research software industry. The tool is simple and intuitive and works just like a charm. The best part is that it is brand new, it is extremely cost-effective, and it’s only going to be getting better and better as time goes by and the development team adds in new functionality. I do enjoy not making things more complicated than they need to be and KeySearch certainly covers that part. Since KeySearch is still in its launch period, they are offering hefty discounts for those interested in the tool. 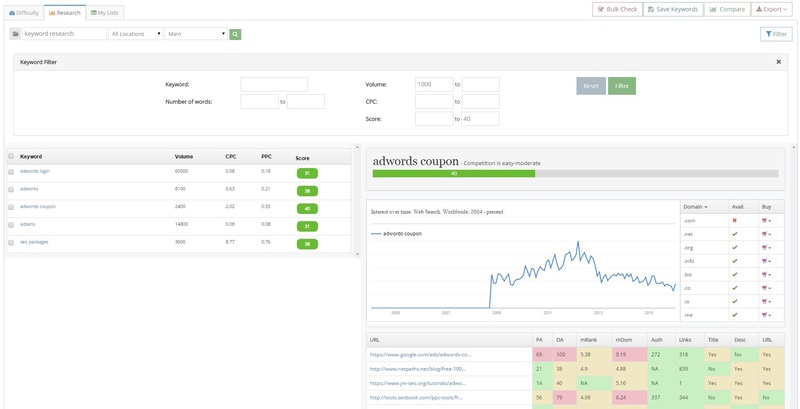 I have managed to get my hands on a 20% lifetime discount coupon for anyone who wants to try this keyword research software. The prices are already extremely cost-effective and with those 20% it becomes too good to be true. The discount coupon is “inetsolutions” for any of you guys interested in trying KeySearch. It is a recurring discount, so you will have 20% off the price of KeySearch for life. So there you have it. We have taken an in-depth look at KeySearch and everything it can currently do and it’s looking solid. I did find a few small bugs while testing the tool, but Dan and his team fixed them as soon as I reported. There are a few things I would change design-wise, but that’s probably because I enjoy perfection divergence more than anyone else. Bottom line is KeySearch is just an amazing tool for anyone who performs keyword research on a regular basis. I said it at the beginning and I will say it at the end – websites that rank at the top positions in the SERPs always have a solid keyword strategy or just an incredible amount of luck. Thank you for this excellent product review. Over the years, I have used a number of different keyword research software applications. The last license I acquired was LongTailPro – I will need to review KeySearch functionality to see if I should give it a try. I have had a lifetime license for FCS for almost 3 years now and use it almost daily to excellent effect. The developer of FCS has his act together for sure so I would imagine KeySearch is and will continue to be a quality product. For ranking, I have been using Ezee Rank Tracker for the past 2.5 years and I can’t imagine using anything else in that regard. I have been using FCSN for quite a while now as well and I knew that KeySearch will be something great. It’s easy, it’s simple and it’s intuitive. Everything a keyword research process should be. As for LongTailPro, I have not used it in a while, but I keep on hearing only good things about it. Another great article Doncho :) What do you think, will LSI keywords remain important in the future or will we see some other new concept instead of it? I’d love to hear your feedback on it. It might make a nice addition to your post where you mention “LSI keywords suggestion”. I will take a look as soon as I can mate. It seems like a comprehensive read, but I’m swamped with stuff right now. Good luck with your job and talk soon, Doncho! Took a quick look at it and it’s great mate. Linked to it right after that from the article.